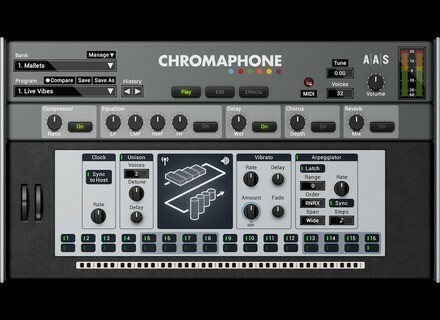 Chromaphone 2, Physical modelling virtual synthesizer from Applied Acoustics Systems. Applied Acoustics Systems announces the release of the Chromaphone 2 acoustic object synthesizer for Mac OS X and Windows. Applied Acoustics Systems has released an all-new version of its Chromaphone creative percussion synthesizer. Chromaphone is a synthesizer which uses acoustic resonators to create drums, percussion, mallet, string, and other unique instruments. Drumheads, bars, marimbas, plates, strings, and tubes are combined into pairs and played by a configurable mallet and a flexible noise source. A proprietary coupling technology, which models how vibrating objects interact and influence each other, captures key acoustic behaviours of musical instruments resulting in a vast range of sonic colors. Chromaphone 2 features a new streamlined interface, a new equalizer and compressor module, a new multi-effect processor, a new drumhead resonator, and more. The factory library has been redesigned and includes signature presets by artists and sound designers Sean Divine, Thiago Pinheiro, Daniel Stawczyk and Christian Laffitte. Chromaphone 2 is available now at a suggested retail price of $199 but until April 11th, it is offered at the introductory price of $149. During this same period, all purchase also include the new Synbiosis sound bank by sound designer Daniel Stawczyk, a $39 value. 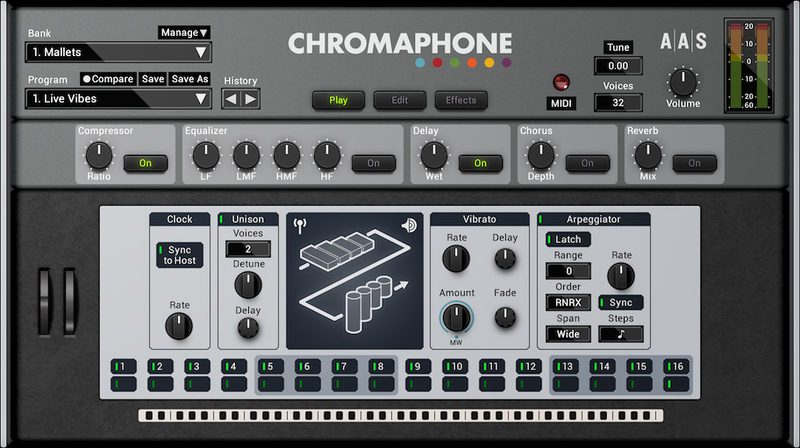 Chromaphone 2 runs on both Mac OS X and Windows in 32- and 64-bit host sequencers supporting the VST, Audio Units, RTAS, and AAX Native plug-in formats. More details at the AAS website. Waves introduces BSS DPR-402 plugin Waves presents a plugin rendition of the versatile dynamics processor DPR-402 by BSS. Loops de la Crème releases Retro Strings Loops de la Crème has released their new ROMpler, Retro Strings.